Want to recover permanently deleted photos from iPhone but do not know how? Read this guide to get the best solution. This powerful tool can help you recover permanently deleted photos from iPhone without effort. Just try it by yourself to get back your lost pictures. As is known to all, there is an album called Recently Deleted on iPhone storing all the pictures that you tend to remove from the device. They will be actually removed from your iPhone after 30 days. 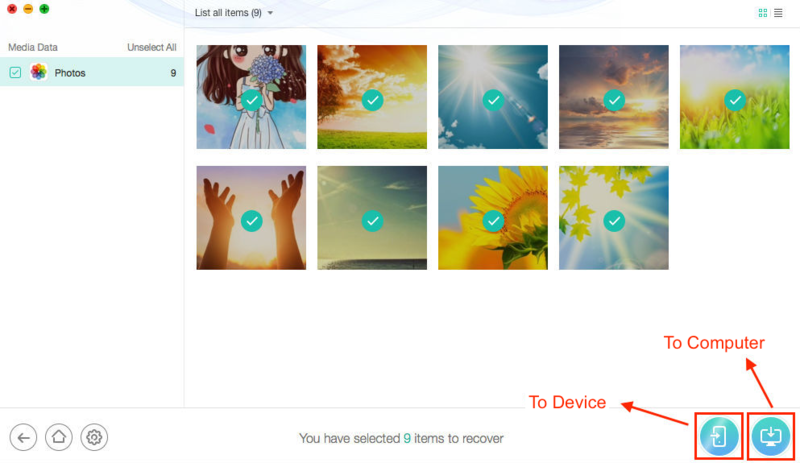 With this feature, you can easily recover some photos that you deleted accidentally. However, sometimes, when you eager to delete some pictures to free up iPhone space, you may choose to clean the Recently Deleted album at once. Then you suddenly find that you just delete some precious pictures that you want to keep forever. What’s worse, you have no backup. Then is it still possible to recover permanently deleted photos from iPhone? Don’t worry. The answer is Yes. PhoneRescue is the solution. PhoneRescue for iOS is one professional data recovery tool that aims to help users recover lost iPhone/iPad/iPod data in 3 ways, from device, from iTunes backup, from iCloud backup. As for photo recovery, it helps you scan and find permanently deleted photos on iPhone directly. You can choose to preview, select and download the photos to device/computer with the original pixels. Or if you have made a backup before, you can choose to extract the pictures from iTunes/iCloud backup. So you do not have to restore the whole device. How about give it a try? Go to PhoneRescue download page and choose Download for iOS and to get started on your Windows or Mac. Step 1. Launch this 2018 top iPhone data recovery application – PhoneRescue for iOS > Connect your iPhone to computer via USB cable. Step 2. 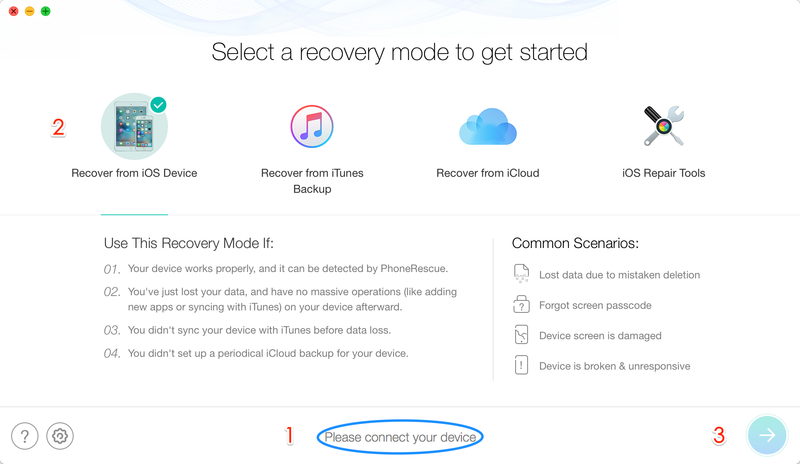 Choose Recover from iOS device > Click the Right Arrow. Step 3. 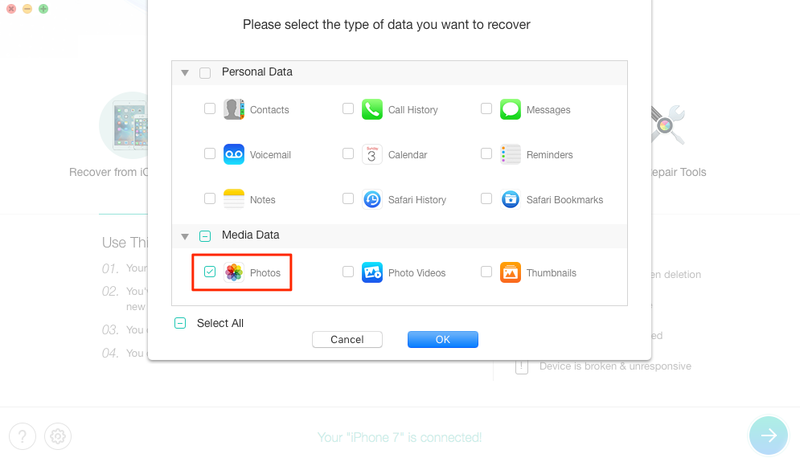 It will let you select the type of data you want to recover, just tick Photos and click on OK to scan your iPhone. Step 4. Preview and select the photos you want to recover > Click To Device/Computer button to recover selected photos. PhoneRescue for iOS is quite easy to use and it does not need you to have any technical knowledge. You can recover your lost photos as well as videos, contacts, messages, notes and any other data that matter to you most without effort. Get it Now >.